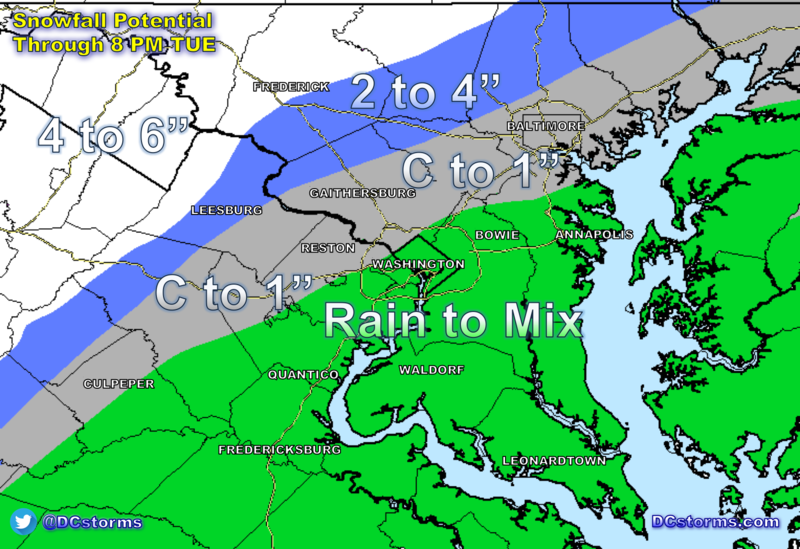 Rain will develop before rush hour on Tuesday across the Washington Region with a quick transition over to heavy, wet snow across the foothills of the Blue Ridge mountains, Shenandoah Valley and northern Maryland. 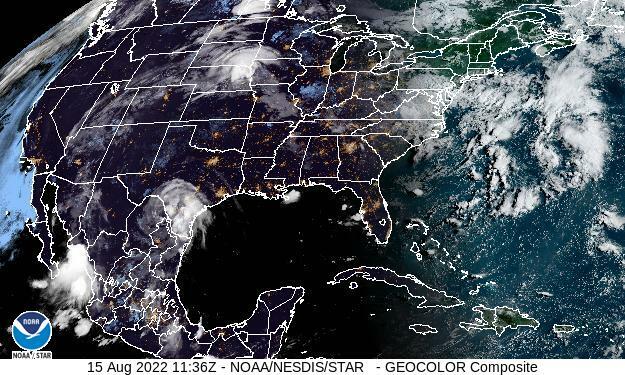 The model animation below is from the high-resolution Canadian model which has come into alignment with the European forecast model. The animation shows rain developing at 07Z (3AM) and quickly changing over to Snow through the mid-morning hours west of the immediate metropolitan area. The animation ends at 4PM when a moderate to heavy mix of rain and snow may be setting up right across the interstate 95 corridor. Those of you commuting to the northern and western suburbs on Tuesday afternoon should plan for conditions to deteriorate, especially on secondary, untreated roadways as temperatures cool into the lower 30s. 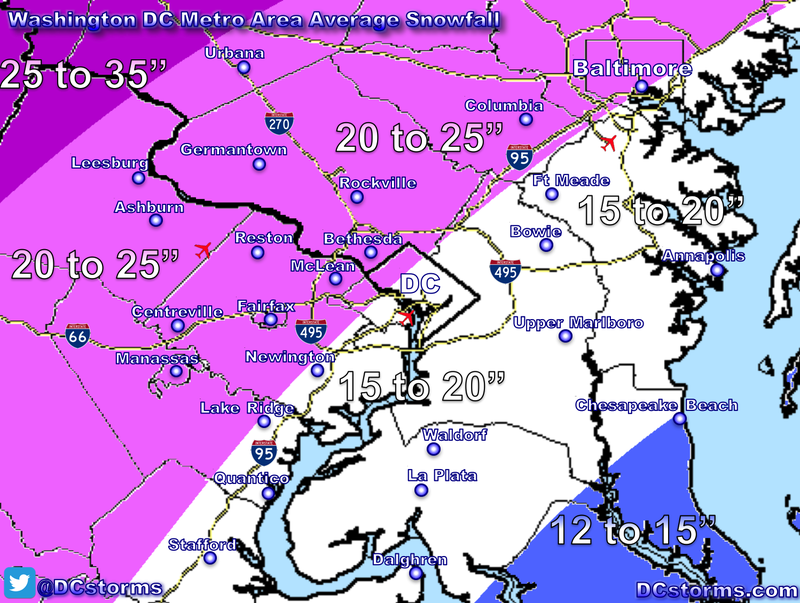 – Forecast Confidence is Low with higher accumulations (1 to 3″) possible across DC’s immediate northern and western suburbs between noon and 6PM (if temperatures end up cooling faster than anticipated). – Yes the March sun-angle is higher, however, if precipitation does come down at a fast enough clip, snow could become the more predominant precipitation type and slushy accumulations would become more likely across the 95 corridor on Tuesday afternoon. The animation below is also from the latest high-resolution Canadian model from 4PM Tuesday through 8AM Wednesday. The overnight hours on Tuesday through Wednesday will be key as temperatures will have cooled to the freezing mark at the surface with snow falling across much of the region along and west of interstate 95. Untreated roadways will become slush covered and snow may come down heavy at times depending upon how close to the coast the second system tracks. Winter Storm Warnings may be required across parts of the region when taking into account the snow that will fall Tuesday and Wednesday with our northern and western areas possibly picking up 5 inches or more of snow through the entire event. 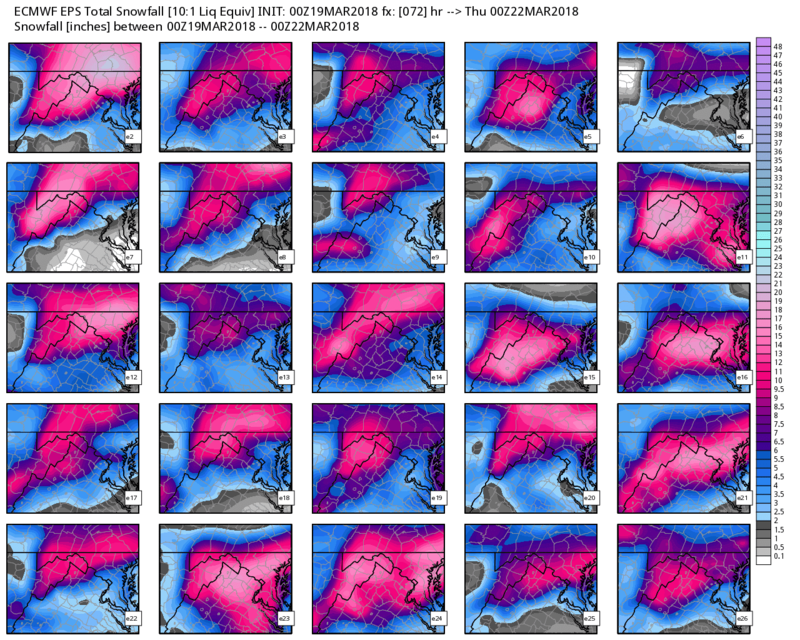 European Ensembles below have remained steady in showing the potential of some high impact snowfall accumulations across parts of our Region. Locations receiving mostly snow could pick up to 5 to 10 inches of heavy wet snow (combining snowfall from Tuesday and Wednesday). Gusty winds behind the departing nor’easter could cause power outages due to the weight of the snow on tree limbs. 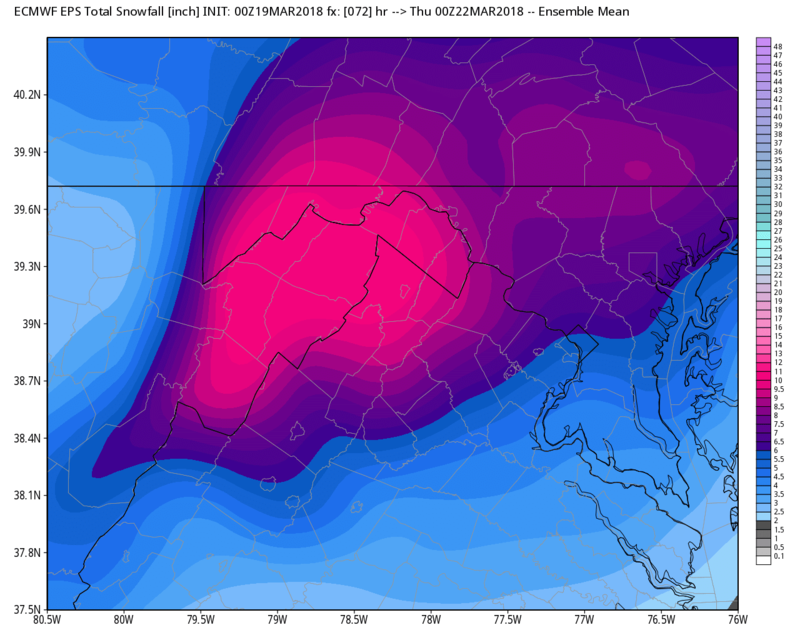 – Higher confidence of 5 to 10 inches across northwestern Virginia (Frederick, Clarke, and Shenandoah counties), western and northern Maryland (Washington, Frederick and Carroll counties). Fredericksburg/southern Maryland across the Chesapeake Bay: These locations are not out of the woods. 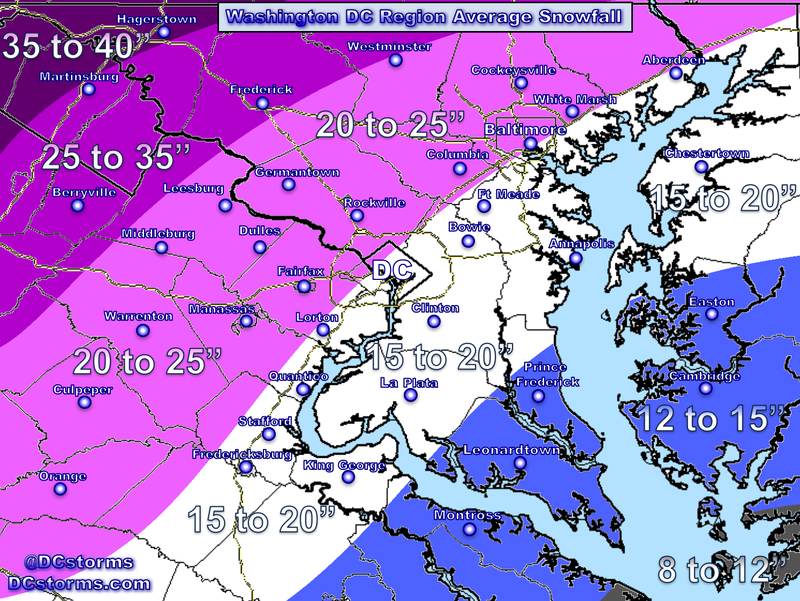 If the secondary low pressure system hugs the coast… heavy snow on Wednesday could add up in these areas as well. 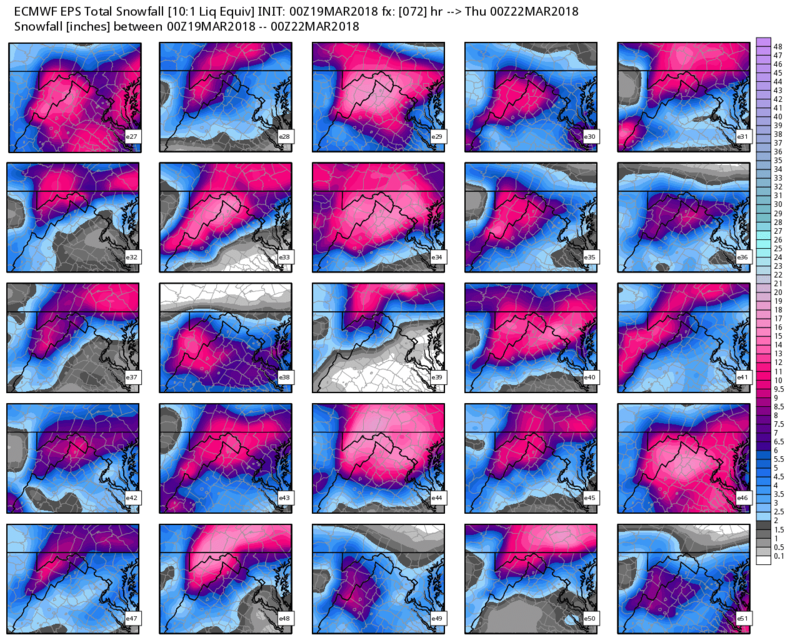 We will know a lot more once the European Model updates later this afternoon!